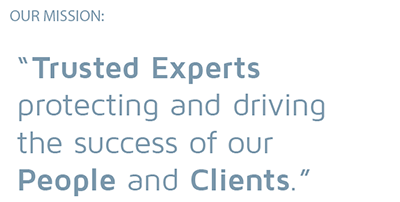 About Us - Alper Services, LLC. At Alper Services, we take pride in the company we keep and the successful businesses we help build. We are Insurance Architects who design programs that minimize risk, protect assets and reduce liabilities by using a proactive and intuitive approach to each Client’s complex business needs and exposures. Founded in 1966 by Howard Alper, our Team has many years of experience providing innovative and dynamic insurance services. Our structured process starts by understanding your business; identifying your expectations, future plans and projected goals; evaluating past insurance claims and gaps in your policy coverages; and determining industry changes that might affect your business. Then, we design and implement a customized risk management plan to ensure you are prepared for the future. We don’t stop there. Our Team of Experts monitors your business to support you when you need us. We take a fresh and strategic approach to implementing programs that balance the realities of now with the eventualities of when. Let us design a program for you. Howard Alper founded Alper Services LLC in 1966. His vision and goal have always been to provide businesses with superior insurance services which also reduce risk and maximize value. For over 50 years, Howard has built long-lasting relationships with Clients and developed strategic alliances with many highly qualified insurance carriers and professionals. David Macknin has almost thirty years of professional experience in enterprise risk management, business insurance, employee benefits and strategic leadership. He has developed a regional and national Client base across a wide range of businesses. David's focus is four-fold: The well-being of Alper's Team Members, optimizing the firm's Clients' experiences, being a dedicated business partner to insurance providers and successfully continuing to grow Alper Services. Leslie Morse is the Chief Operating Officer and oversees many areas which contribute to Alper’s exceptional reputation for service, including Loss Control, Risk Management Consulting and Claims Management. As an attorney, Leslie acts as an advocate for Clients, working closely with adjusters and defense attorneys in the formulation and implementation of strategies to efficiently resolve claim issues. Bobette Puckett has over 30 years of experience and knowledge of the industry, including a successful two-year term as President of Alper. She is a Comprehensive Insurance Architect, helping her Clients manage risk and increase profitability through innovative programs, custom services, and creative solutions. Bobette also oversees the Alper Dealer Programs. Chris Breck began working at Alper Services in 1989 and is now a Senior Vice President managing the day-to-day insurance and business needs of many of Alper Services’ oldest Clients. He specializes in delivering alternative risk solutions, including captive insurance programs. Chris maintains a broad industry focus which includes manufacturing, service, retail, healthcare and not-for-profit companies. Gregg Elstien has been serving the needs of manufacturing and social service organizations at Alper since 1995. He feels that in order to develop a long-term relationship, it is critical to determine if what we do can make a significant impact on current and future goals that align with the firm’s vision. To be a complete partner, Gregg further provides his Clients access to the vast network of professionals he has developed over the last 20 years who are recognized as best in class. He puts all of his energy in striving to make a positive difference on the lives of others. Dan and his Clients joined the Alper Services family in 2013, continuing a stellar and accomplished brokerage career which started in 1970. With an emphasis on Property & Casualty insurance in the real estate, hospitality, entertainment, development/construction and emerging technology sectors, Dan has the expertise and experience to listen to, understand and achieve our Clients' objectives. With more than 30 years of experience, Mary Jakocko is responsible for invigorating Alper Services’ new business outreach efforts. Having worked with several prominent financial services and insurance organizations in her career, she has formed strong relationships within the marketplace. Mary has extensive experience working with Clients of all shapes and sizes, particularly in the manufacturing, non-profit, family trusts, real estate and labor unions sectors. Micah Kafitz has been serving the needs of Alper’s Clients since 2013. He is an advocate for Clients in the real estate, manufacturing and technology industries. Micah understands that every business is different and the needs they have are as well. He helps them identify ways that Alper can help improve their business. With more than 20 years of experience, Ken Cuvala is responsible for growing and cultivating efforts for Clients of Alper Services’ Select Division—those Clients that exist outside of its traditional middle-market concentration. He oversees new business opportunities for all middle- and large-market prospective Clients, and mentors those on his Team to become smarter and more impactful insurance professionals. Ken has focuses on the “Customer Centric Approach” in which he fully engages with Clients and responds to their every insurance need on a daily basis, developing comprehensive and cost-preventative insurance programs that will provide Clients with a distinct advantage over competition. Gary is a Vice President of Alper Services and the Director of the Alper Global Trade Risk Management Division (AGT). Under his guidance, AGT provides protection for companies who need to manage their commercial trade risk, both domestic and export, as well as to mitigate political risk involving international business investments. Brian Donnelly joined Alper Services in 2017, and works with the Employee Benefits Team to identify and evaluate gaps and opportunities to provide Clients with multi-year health and welfare benefit solutions. In his role as Health and Benefits Practice Leader, Brian oversees all aspects of Client servicing from retention and satisfaction to growth. Brian has over 15 years of human capital and management consulting experience working with fully-insured and self-funded health and welfare benefit plans for employers. With 20 years of employee benefits experience, Will Pinn ensures that the Alper Services’ Employee Benefits Division meets and exceeds the expectations of their Clients. Responsible for educating Clients about new and existing legislation and regulations, Will sees to it that his Team stays abreast of new benefits trends, products and solutions available to employers. With expertise in fully-insured and partially self-funded medical insurance, long-term disability and HIPAA compliance matters, Will joined Alper Services after spending the last 18 years as an Employee Benefits Consultant in the Chicagoland area. Yvette Bickcom has over 15 years of expertise is in designing cost-effective plans for groups with 25 or fewer employees. She is also an advisor and knowledgeable resource for Clients transitioning from group plans to individual health and Medicare products. Yvette is passionate about educating employees and helping them understand the often complex world of benefits. Michael Jones manages insurance services and creates programs for highnet worth individuals and families. He ensures that the unique insurance needs of his Clients are met by reviewing potential exposures, loss experience and current coverages. He analyzes and creates comprehensive personal asset protection programs, recommends appropriate products and services, and acts as his Clients’ advocate when working with insurance carriers. Deborah Shahpar is an Account Executive in our Personal Lines Division. She holds a PLCS (Personal Lines Coverage Specialist) designation and specializes in designing and implementing personal risk management programs for high-net worth individuals. Recognizing Clients’ unique insurance needs, Deborah works to assess their specific exposures and develop tailored risk management strategies. Deborah is dedicated to her profession, staying up to date on industry trends, and is always a strong advocate for her Clients. Deborah graduated from Indiana University with a Bachelor of Science in Forensics. She has worked in the insurance industry for more than 30 years in the city of Chicago. Mark Jacobson has been in the insurance business for 30 years gaining expertise from working primarily with high-net-worth individuals, families and family offices. Being in charge of operations of Alper Services’ life insurance, disability insurance and estate planning services, Mark is leading the charge in expanding Alper Services’ depth and breadth of insurance services. Rich Swoik has headed the AuditRate® Division at Alper Services since 1984. Serving as a Client advocate, he uses his decades of experience working with rules, regulations, and insurance laws to uncover and recover insurance premium overcharges related to Workers' Compensation and General Liability. As the Director of Claims Management, Regina Ruffin oversees Alper’s Claims Management Team, which includes claims administrators, a workers’ compensation claims specialist and our network of loss control specialists. She also advocates for Clients to ensure the prompt resolution of their claims through claims reviews and loss reports as well as coordinating Alper’s loss control programs that lend to a safer work environment." Cindi Elstien utilizes her years of experience and knowledge in the Human Resource profession as a benefit to Alper Clients. She offers unique hands-on experience, serving as both HR Practitioner and Consultant. She educates Clients in the area of Human Resource “Best” Standards of Practice, while maintaining compliance with applicable local, state and federal employment law. Bill McGrath is the Director of Finance and oversees the accounting department. He joined Alper Services in 2003 as Accounting Manager and became Director of Finance in 2008. Bill has a bachelor’s degree in accounting and has completed Loyola University’s mini-MBA program. He is responsible for financial planning and analysis, budgeting and forecasting, financial reporting, and cash management. Find out more about careers at Alper Services.